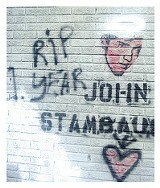 The Best Midtown stencil artists do it in the street. After University of Memphis student John Stambaugh was killed by a shotgun while delivering pizza near Cooper and Young, friends created a memorial with flowers and verse in the parking lot where he died. 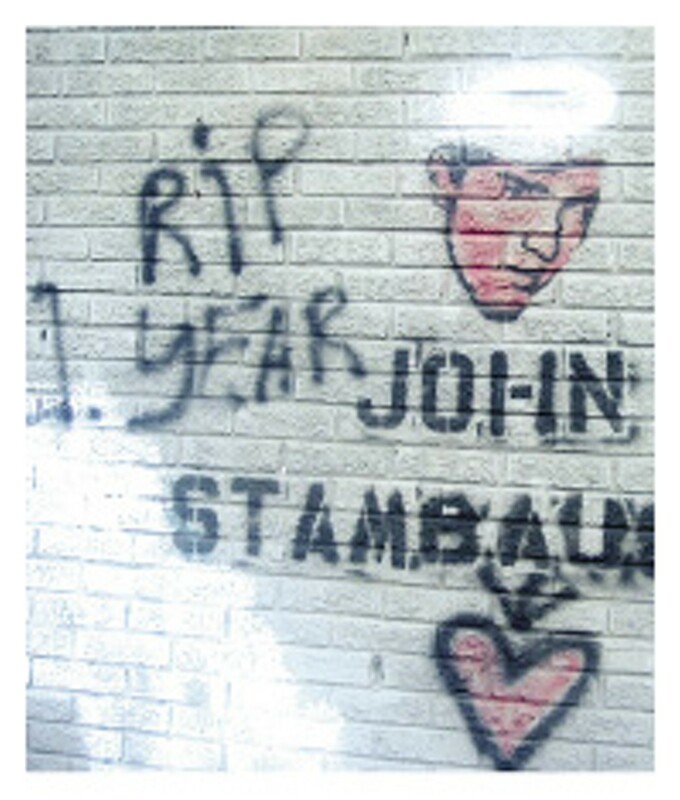 A few days later, a more endearing tribute emerged: stencils of Stambaugh's face spray-painted as street art in pink or red. Sometimes the stencils were embellished with a halo or a heart. Frequently, there were words too, such as "We love you," or questions, such as "Who killed the pizza guy?" Today, more than three years after Stambaugh's death, many of the stencils remain, dimmed a little by sunlight and weather but still visible on concrete overpasses and commercial buildings and the blue bus-stop bench at the intersection of Walker Avenue and Patterson Street. These stencils, impromptu but poignant, have lasted, communicating a message over and over in a creative and thought-provoking way. The longevity of the Stambaugh stencils, along with the feelings behind them, is why the images rank at the top of the A-list for the best street stencils in Memphis. But there are plenty of other stencils, as well. Some are decorative or political or just plain fun. Many are downright confusing. But all are stenciled anonymously, and sometimes illegally, as part of an international community of artists trying to impact urban landscapes dominated by corporate interests. "People are desperate for ways to talk back," says artist and author Josh MacPhee in an interview from Troy, New York. "The streets of a city are one of the few places where people with limited resources can reach a large and diverse audience." Historically, stenciling started at least 5,000 years ago when people first blew colored powder through their hands to create stencils of animals on stone. Later, artists used stencils to decorate pre-Columbian pottery. By the mid-1800s, traveling artisans carried tin stencils and paint door-to-door to decorate houses, furniture, and businesses. During World War II, fascists in Italy stenciled Mussolini's face on buildings as propaganda. In America, stencils showed up as pop art during the 1950s and as protest art against the Vietnam War during the 1960s. "By the 1970s, groups of conceptual artists and punk-rock artists started stenciling on the streets, especially in large cities," says MacPhee, who wrote a book published last year called Stencil Pirates. 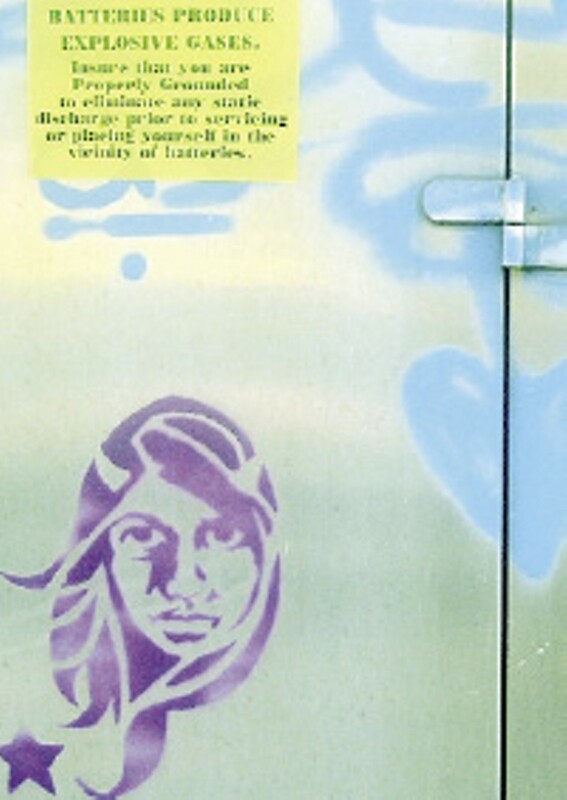 "By the 1990s, stencil culture was fusing with traditional graffiti culture, which leads us to today: a stencil scene made up of political activists, artists, graffiti writers, and people who fall somewhere in between." In Memphis, the best street stencils reflect many of these artistic trends. Think of the stencils, scattered primarily around Midtown, as a kind of urban folk art. Consider, for example, the dapper fashionistas on the brick building painted white at the corner of Lamar and Castalia. The images were painted by Brick (artist James Brigance) and advertise "Bobbie's T's Fashons and Alterations" in a stenciling style popular with retailers decades ago. Unfortunately, some of our other favorite stencils (like the Buddy Holly faces and the Stambaugh mural on the exterior wall of Young Avenue Deli) are difficult to find or have disappeared altogether under a fresh coat of paint. 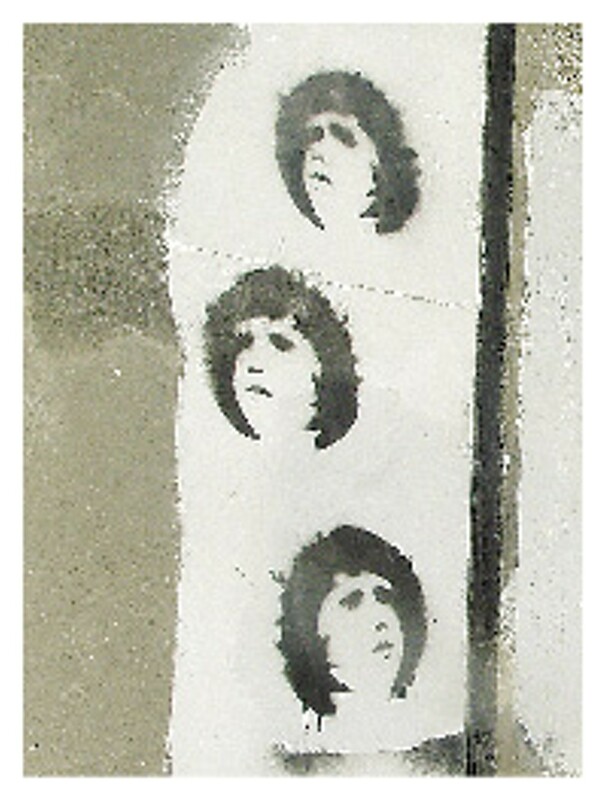 Others are easier to spot, including the images on the rest of our street stencil A-list. Here are more specific descriptions where stencils are found, but be sure to keep looking on your own. The best part of stenciling, after all, is the fun of discovering new images in unexpected places. Cinderblock building at Blythe Street and Young Avenue: Located across the street from Midtown's Goner Records, the wall on this small commercial building is an ever-changing canvas for stencil and graffiti artists. The wall is located adjacent to the parking lot, so pull in for a close-up look. 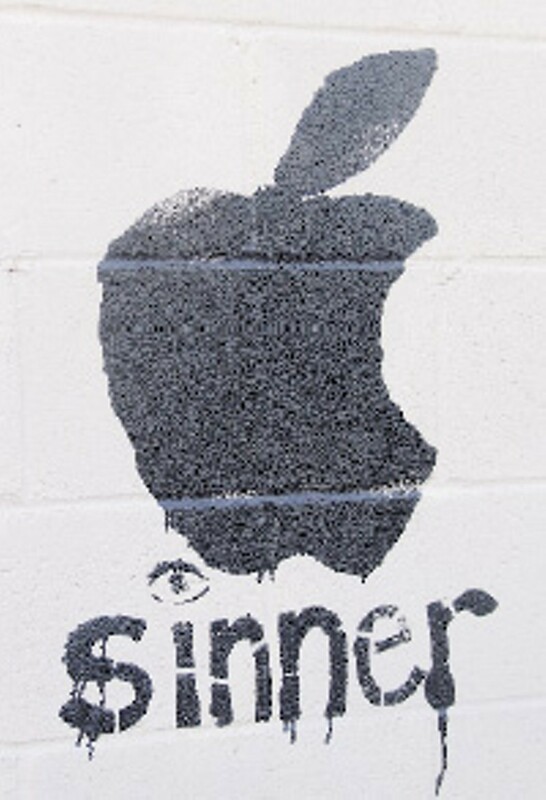 We especially like the stencil of the black-hair beauty near the Apple logo embellished with the word "sinner." Railroad overpass at Central Avenue and Lombardy Road: When driving west on Central Avenue, turn right on Lombardy and park. Look to your left, where stenciled on the overpass in a stack of three are the wistful images of a face we fondly call Angel Boy. Then again, maybe it's Angel Girl. Is this a control box for trains or some electrical box operated by MLGW? We're not sure. What we do know is that the lovely stencil of a girl with ethnocentric features and shoulder-length hair improves the appearance of the metal box immeasurably. Electrical box on the east side of the Parkway overpass at Southern Avenue: This stencil of facial features is almost gone, but we still appreciate the image because of the dripping paint that resembles tears.